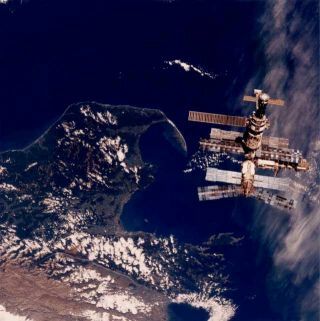 Russia's Space Station Mir, orbiting high above New Zealand in 1996 during NASA's STS-76 mission. Spacecraftstart out clean - as close to germ-free as humans can make them. But afteryears of use, unused spaces within the walls can become home to unwanted lifeforms. When NASA joined theRussian space program in its evaluation of the microbial activity aboard the Mir spacecraft, they made some interesting discoveries.NASA's plan was to obtain information that would be useful during long-durationmissions. Mir had suffered severalpower outages during its fifteen years in low earth orbit; temperature andhumidity had gone well beyond normal levels. In 1998, NASA astronauts werecollecting samples from air and surfaces. Imagine their surprise when they openedan obscure service panel in Mir's Kvant-2 Module and discovered a free-floatingmass of water. "According to the astronauts' eyewitness reports, theglobule was nearly the size of a basketball," C. Mark Ott, healthscientist at Johnson Space Center in Houston, Texas, said. Following a thoroughsearch, several more globules were discovered. The water wasn't clean, either;two of the blobs were brown and the other was milky white. Samples taken backto Earth for analysis contained several dozen species of bacteria and fungi,plus some protozoa, dust mites (see photo),and possibly spirochetes. The temperature behind the panels was a toasty 82degrees Fahrenheit - perfect for microorganisms. Colonies of unwantedorganisms were also found growing on rubber gaskets around windows, on spacesuit components, cable insulations and tubing, on the insulation of copperwires, and on communications devices. In the near future,astronauts won't need to send out the samples to a lab. They will use the new LOCAD-PTShandheld microorganism detector, developed by NASA to give results in justten minutes. "Microorganisms can degrade carbon steel and evenstainless steel. In corners where two different materials meet, they can set upa galvanic [electrical] circuit and cause corrosion. They can produce acidsthat pit metal, etch glass, and make rubber brittle. They can also foul air andwater filters." Science fiction authorshave worried about unwanted alien life forms in spacecraft for years. In his1985 novel Schismatrix,sf author BruceSterling wrote about "sours:"
Ten years earlier, rat-sizedaliens with inborn engineering skills destroyed a spacecraft from withinthe walls in The Motein God's Eye, by Larry Niven and Jerry Pournelle. In the 1960's, the problemwas addressed humorously in The Trouble with Tribbles, a classic StarTrek episode written by sf author David Gerrold, first broadcast on June 21,1968. Storage bins on Deep Space Station K7 are being used to storequadro-triticale, a bio-engineered grain. Irresponsible entrepreneur CyranoJones brings cute furry animals called tribbles onto the station. It turns outthat tribbles get into everything, and have a spectacular rate of reproduction(according to Dr. McCoy, "they're born pregnant"). The station issoon shoulder-deep in tribbles (see photo). What are your favoritealiens hiding in the walls of spacecraft? Read more at Science@NASA.